Daniel “Nane” Alejandrez, founder and executive director of Barrios Unidos, a community-based organization dedicated to prevent, treat, and eliminate youth gang violence, is the keynote speaker for the 12th annual Cesar Chavez convocation at UC Santa Cruz. The convocation is set for 7 p.m. Tuesday, May 12, at the College Nine/Ten Multi-purpose Room on the UC Santa Cruz campus. (Doors open at 6:30 p.m.) It is free and the public is invited. The convocation honors the memory of Chavez, his achievements, commitment to social justice and civil rights, unrelenting efforts to cultivate grassroots leadership, and successful formation of the United Farm Workers Union. Alejandrez was selected as keynote speaker for his valiant efforts in pursuing the security, peace, and empowerment of urban America. Alejandrez, is a veteran activist in California’s Latino communities, struggling to stop what he calls “the madness that destroys our youth.” He founded Barrios Unidos, in Santa Cruz in 1977 that has grown to be acknowledged as one of the nation’s most impressive grassroots organizations addressing issues of youth, violence, and gangs. It is in the process of developing the Cesar E. Chavez Institute for Social Change that will involve a multi-cultural and international community-organizing component. From the barrio to the United Nations, Alejandrez has spread his message, which combines analysis of the root causes of crime with concrete programs that offer youth positive alternatives. He is actively involved in decreasing the incarceration and recidivism rates of youth, adults, and those at risk of the penal code system, by providing alternatives within the institutions and communities. He also works in collaboration with the Fair Trade Movement for coffee growers in Central America and African countries to help educate the public on fair trade and farmer’s sustainability. 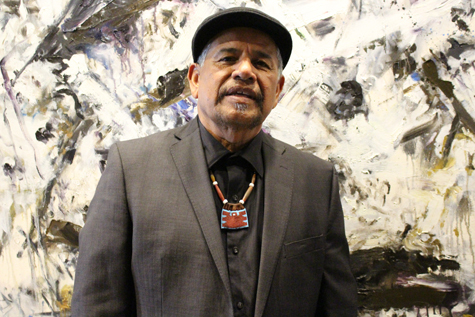 Alejandrez served as co-chair of the Urban Peace Summit in Kansas City and has received numerous awards including the National Fellowship of Reconciliation Martin Luther King Jr. Award, the Sankofa Lifetime Achievement Award, and a fellowship for the California Wellness Foundation. As an organization, Barrios Unidos has received the Leteher-Moffitt Memorial Human Rights Award from the Institute for Policy Studies. Past convocation speakers have been Homies Empowerment co-founder and assistant dean at the Harvard University Secondary School Program Cesar Cruz (2014); UFW co-founder Dolores Huerta (2004/2013); playwright, screenwriter, filmmaker and director, sLuis Valdez (2005); United Farm Workers President Arturo Rodriguez (2006); Executive Secretary-Treasurer of the Los Angeles County Federation of Labor, AFL-CIO, Maria Elena Durazo (2007); performance artist Guillermo Gómez-Peña (2008), Kent Wong, director of the UCLA Labor Center (2009); María Hinojosa, journalist, managing editor of Latino USA (2010); Father Gregory Boyle, executive director of Homeboy Industries (2011); Pulitzer Prize winning journalist, Jose Antonio Vargas (2012). The Cesar Chavez Convocation is presented by the College Ten Co-Curricular Programs Office and The Chicano Resource Center (El Centro). It is co-sponsored by: Office of the Dean of Students, Office of Diversity, Equity, & Inclusion,Office of Diversity Equity and Inclusion, Community and Resource Empowerment-(e2), Porter College Senate, Kresge College Senate, Crown College Senate, Merrill College Senate, Cowell College Senate, Stevenson College Senate, College Eight Senate, Oakes College Senate, Students Informing Now (SIN), Hermanos Unidos de UCSC, Women's Center, Lionel Cantu Queer Resource Center, American Indian Resource Center, Asian American Resource Center, African American Resource and Cultural Center.